Dump Bins – They’re Hard to Miss! As dump bins are large floor standing display units they’re not easy to miss and due to their size a great deal of product can be offered for sale. Either a single line or a range of different items can be promoted in dump bins and grabbed as customers pass by. 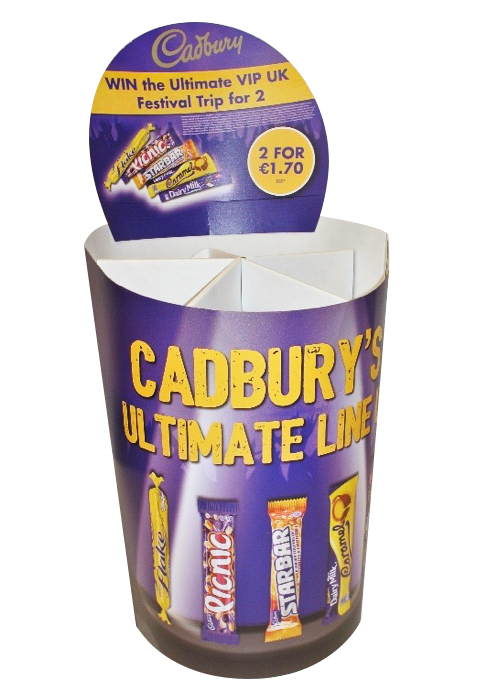 Perhaps the original cardboard display packaging, dump bins have been around for a long time and have been designed and manufactured in all manner of different permutations, designs and sizes. With our without headers, simple square or multi-sided, whatever works best for your product and encourages purchase. Many clients choose the large floor standing dump bins to display a range that complement each other and are often bought as ‘bundles’, the strategy can increase the value of a purchase as it is often very eye catching. Please contact us now to discuss how we can help you with your dump bins.